Last night, we past out at 8:00 PM and woke up around 3:00 AM with nothing to do. I know I mentioned we are early birds but 3:00 AM is a tad bit early. We killed time by watching the current season of American Horror Story then finally left the room to grab bao's at the 7-Eleven across the street. 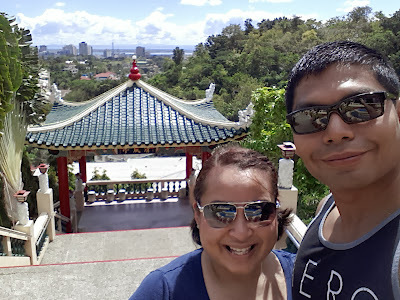 The forecast predicted thunderstorm today so we cancelled our plans to go to Plantation Bay and hired a private car for a Cebu City tour instead for a little art, history and culture. We booked the car through the Henry hotel for 1200 pesos (about $27.50 USD) the first 3 hours and 400 pesos (about $9.00 USD) thereafter. I don't know why they didn't just say 400 pesos an hour with a 3 hour minimum. Anyhow, this was still cheaper than booking the tour through a local travel agent and being herded into shuttle vans with other slow moving tourists. Our first stop was the Taoist Temple in Beverly Hills, yes you read that right, Beverly Hills. I had read online reviews and was warned about the hike up the steps to the top of the temple. I prepared myself and wore a sports bra, gym pants and sneakers. The "hike" was a joke, I admit I was a little out of breath but it was fine. I was over-prepared. The temple is still a functioning religious institution and there were worshipers present. We respectively walked around and observed the beautiful architectural details. The Cebu city view from the top was beautiful. I would definitely recommend hitting up this local attraction. We tried to visit the Cebu Provincial Museum (Museo Sugbo) but it was closed. Our driver pulled over and we were able to view the former Spanish period prison from the gates. The next stop on the tour was Fort San Pedro, the oldest fort in the Philippines that served as a stronghold for revolutionaries near the of the 19th century. It was a military defense structure built by the Spaniards and Cebuano people. It was remarkable to see the canons strategically positioned throughout the site. Magellan's Cross and Basilica Del Santo Nino were at the same location. It probably wasn't the best idea to go to church on a Sunday morning. There was an ongoing service and hundreds of devotees was in attendance. The Heritage of Cebu monument was next. This was the Mo's favorite city attraction. The sculpture took three years to make and illustrates the significant events in Cebu's history. Across the street, was the Yap Sandiego Ancestral house, this was my favorite of all. This is said to be the oldest house in the Philippines with % of its structure dating back 300 years ago. The staff person was very knowledgeable and enthusiastic. He gave us a tour and explained the history of the family and the house. The house was given to one son among many other children because of his devotion to preserve it along with the other antiques collected from other members of the family. We were told that the owners still live there a couple days a week so they can maintain a presence in the house. The family portraits show the lineage of the family from generation to generation. Vintage cookware and "birthing" chairs helped one reflect on the way of life centuries ago. 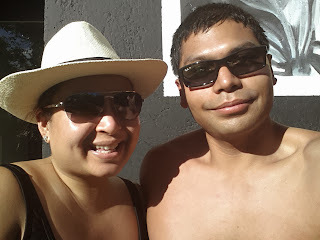 We ended our tour with a great barbecue lunch (separate post) at Larsian and spent the rest of the afternoon reading by the pool at the Henry.